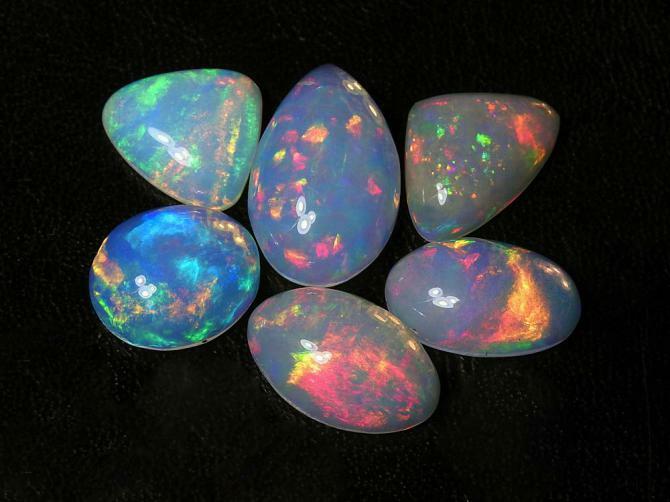 6 Stone bright, colorful, crystal Welo opal cabochon parcel. We want you to be completely satisfied with the stones you buy from us. If you are not satisfied, for any reason, you may return a complete unaltered (please...no grinding, sanding, sawing, removing matrix or clay or soaking Welo opals in water) parcel/single stone purchase (within a 7 day inspection period...14 day international) for a refund or exchange minus shipping costs. Contact us for additional purchasing, orders, and shipping information.